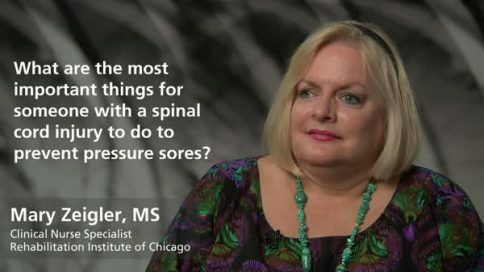 Expert videos for information on pressure sores. Learn about identifying and treating pressure sores, and preventing future sores with diet and hydration. Why are pressure sores so serious? 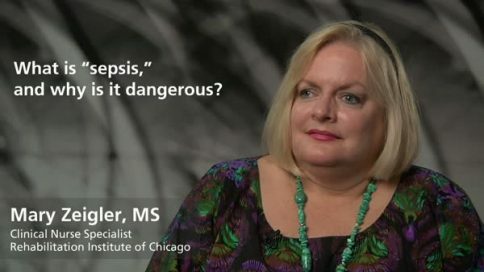 What is "sepsis," and why is it dangerous? How common are pressure sores in people with spinal cord injuries? Why are people with paralysis especially prone to pressure sores? What parts of the body are most likely to develop pressure sores? Is it true that a pressure sore can develop in a few hours? What are the most important things for someone with a spinal cord injury to do to prevent pressure sores? Why is pressure relief so important when sitting in a wheelchair? What’s the best way to select a wheelchair seat cushion? What’s important to know about positioning in bed to prevent pressure sores? What is “skin tolerance” and how can it be increased? What do family members and caregivers need to know about pressure sores? What do family members and caregivers need to do to prevent pressure sores? What role does diet and hydration play in preventing pressure sores among people with spinal cord injuries? What are the six stages of a pressure sore and how are they treated? When is surgical repair of a pressure sore required? How long is the typical healing time for a pressure sore? Why do some pressure sores take so long to heal? Can a pressure sore recur? What is cellulitis, and how is it treated? What's the most important thing to do to prevent pressure sores?